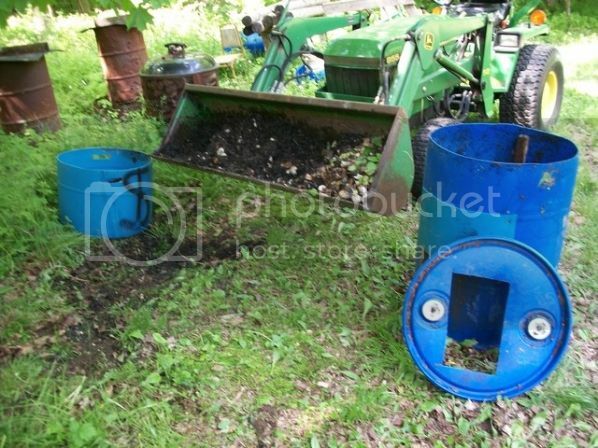 A couple years ago I got an unused plastic barrel set up for bear bait.. I put a patch on the side hole and used it for kitchen compost stuff.. At about 3/4 full, today I cut the top off and emptied it into the loader bucket.. The bottom third of the barrel holds water.. I figured that won't hurt.. Shoveled bottom half of contents into the half barrel on the left to use in plant dirt..
Shoveled the rest back in the barrel newest first.. Re attached the top with wood blocks and screws..
My buddy JD was a big help with this job..
All times are GMT -2. The time now is 03:45 PM.